DescriptionThis portacot is specially designed for families travelling with baby. Light, comfortable, easy to use. Wether you're using it to travel with baby or for a stay in Paris or its area, it offers a safe space for your child to sleep in. And with its tent opening, it will also allow you to use it as a play area during the day. So easy when renting a holiday apartment or staying at the hotel with baby! - Assembly/dissassembly in 1 minute. - Access made easy by the side of the bed, tent opening. - Delivered with a durable and ergonomic carrying bag, with handles. - Instructions for use on the bag. - Cot bottom is together in waterproof/breathable fabric for better comfort and insulation. - Delivered with mattress cover. Delivered with a fitted sheet. Mosquito protection net for free on request. Suitable for children from birth till 4 year old. 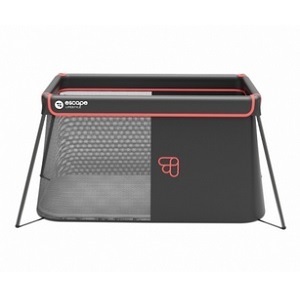 Want to purchase a Naos travel cot? Contact Escape Lifestyle ! Read or download instruction for setting up Naos cot in PDF here. Need to rent a pack n play in Paris for more than 1 month? Contact us for a specific quote. Whatever your plans are for holidays in Paris - stay in the city or travel around France or Europe - we're happy to have this super light, super compact, travel cot available for rental. Easy to carry with its bag, comfortable with it memory foam mat, easy to assemble and dissassemble - make sure to watch the set up video on our page - and convenient - you can use it for baby to sleep at night and baby to play during the day, we're certain you'll be happy to discover this cot, designed by parents for parents!